It is amazing to see how quick young children adopt computers, either for playing simple games with their parents, watch movies on YouTube or Skype with grandparents. 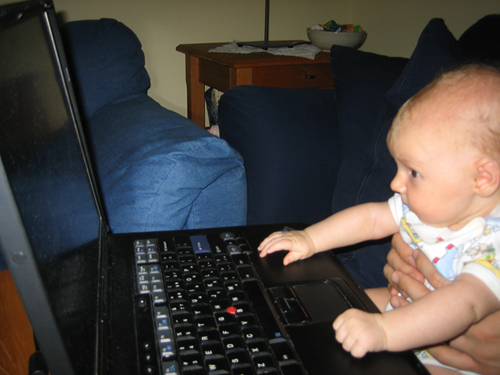 I have a daughter that is three now and I first got her interested in computers when she was around two months old. At that time I was working on a computer game for an old console and I think what attracted her was the colorful big objects in the game and the square wave based music that sounded a bit like cheap toys. Later I bought an educational game collection with Sesame Street and my daughter got hooked to a basic Elmo game where he shows new photos every time she hits a key on the keyboard. I don’t think she was more than nine months when she first started playing the game and the game doesn’t really require much motor skills or intellectual skills, just banging the keyboard and a funny picture appears. At least it was a first successful attempt to interact with the computer. 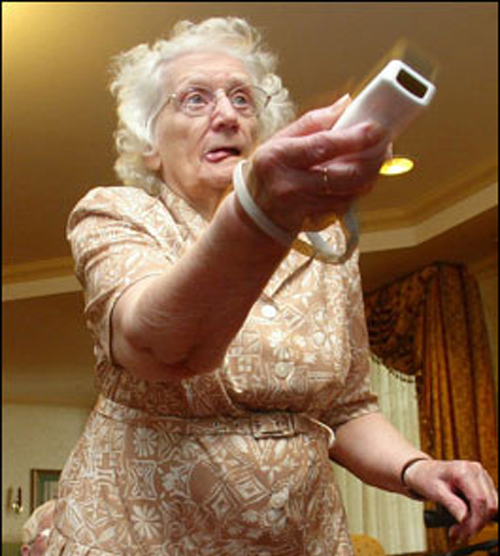 The game collection also contains games to learn how to use the mouse. Nowadays my daughter has certainly figured out that there is some connection between moving the mouse and getting things to happen on the computer screen. But she hasn’t really successfully moved the mouse pointer to an object and clicked the buttons to get something to happen. She’ll of course click the button since she’s seen me do it and occasionally something happen, but she gives up pretty quick. 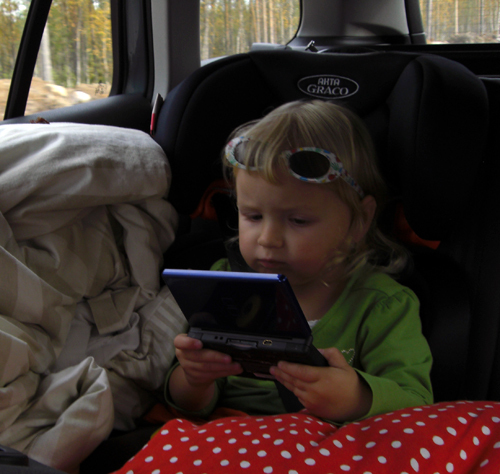 A while back we went on a road trip and I brought my Nintendo DS to have another activity along the usual books, crayons, and toys. My daughter was just over two at the time. I brought two games, Mario Kart DS and a pony game for six to ten year old kids. It was quite interesting to watch how my daughter approached these games and what parts she was able to understand and play. Mario Kart DS is a rally game with a pretty intuitive interface, at least for older people, with a joypad for steering and buttons for acceleration and break. It didn’t take long until my daughter was able to get the car moving back and forward and occasionally steering the car in one direction round and round. She didn’t really master the steering although she understood that the joypad was an important part of keeping the car on the road. More interesting was to see her interact with the pony game. The game is like a Tamagotchi where the player needs to feed and pet a pony. The game is fully controlled by the stylus and the player uses drop down menus to open popup windows where she can pick different types of food to give the pony or to grab tools to clean and pet the pony. I was expecting that both using a stylus and accessing menus would be too hard for her so I started driving the game myself and just have her watch. But soon she wanted to play herself, and I was quite surprised that operating the menus using the stylus was no problem at all. I imagined that the idea of menus was too abstract, especially after seeing her not figuring out how to use a mouse at all. It seems like the biggest challenge with the mouse may not have been to understand what to do, but rather doing it. I recently have bought best ergonomic mouse pad for my office work purpose. Can you think about your PC or laptop using without a mouse pad? How can you operate your mouse properly without a mouse pad? So,I think as it's important,it should have a good quality.